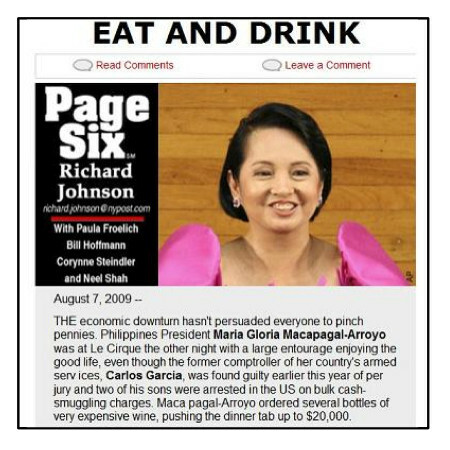 I wrote before that L’Affaire du Le Cirque was insulting and disgusting not because of the political and legal concerns that it raised – something that GMA and her peons were very willing to argue from – but because it hit the Filipino smack dab in the stomach, where it hurts. Impunity – or for all intents and purposes, bastusan – works as an excellent coercive tool because there is perceived power in being bastos, that in some interpretations, it is power. Every act of impunity, especially when it takes place in the political sphere where participation is a privileged position, is a slap in the face where turning the other cheek becomes somewhat expected. Le Cirque, police sirens on civilian and government vehicles, and the name of a city councilor on a waiting shed is expected: to do otherwise is either innovative or idiotic. That’s how impunity works: it shades the world in black, and all sorts of different shades of gray, and to practice it is to exploit every degree in the gray area. Then we forget: Le Cirque is all but forgotten, GMA entering and leaving Congress at her whim, vindicated by every minor – if not momentary – triumph of amnesia. She’s no longer that wine-swilling, steak-wolfing Head of State who feasted at the expense of a nation in mourning, but a President with a legacy in coffee-table books that take us on a joyride to every claim. She’s now a hardworking Representative, working alongside her son who wants to experiment with tricycle receipts and swear upon all sorts of dander and dash that he’s the best representative for security guards. Yessir, she got away with it. Of course, all of this is expected. In a country mired in poverty, it’s only expected that the rich flaunt their wealth, the powerful use the iron hand, and the rest just shush while God’s in His Heaven and all is right with the world. I believe we’re on the right track with this Administration: getting rid of wang wang, and penalizing people who name public works after their forebears, that’s a good start. In the quest for making Gloria pay, maybe we should demand the meal receipt that, somewhere along all the headlines, got lost. With measures against impunity somehow taking center stage in the Aquino administration, there’s a faint expectation even in this hardened, if not rabid, government skeptic: that at least for the next six years, none of this would be expected. I nearly forgot Maro. Thanks for the reminder! Regarding the meal receipt, can’t we just bug the resto for it?